ABC News Chief Health and Medical Editor Dr Richard Besser is embedded with health workers in Liberia as they travel from town to town with a makeshift ambulance to find Ebola patients and bring them to treatment facilities. "First thing was the headache," a Liberian teen tells me. I've arrived in a remote village with a medical team from The International Medical Corps to take him to an Ebola treatment unit. Ten days ago, the teen, a local bishop's son named Boimah, shared a room with a community healer who died from Ebola last Tuesday, he says. Now, Boimah appears to have the deadly virus, too. After the headache, there were body aches, Boimah says, then fever, vomiting and diarrhea. Now, he has sores and it hurts to swallow. When he opens his mouth, we can see blood on his teeth coming from his gums. 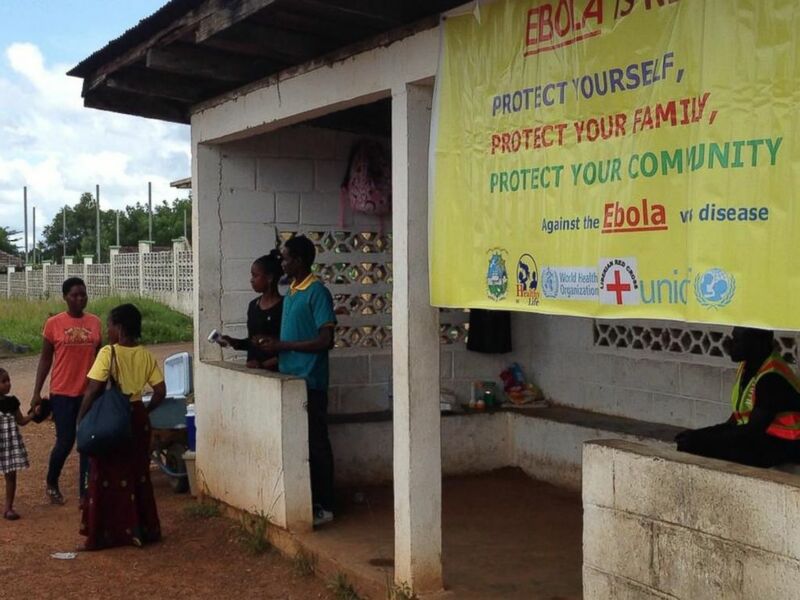 Obama Tackles Ebola at the U.N.
Before we arrived, Boimah’s father walked four hours to a district hospital to get help, but he only came home with antibiotics, painkillers and advice to come back if things got worse. It took some convincing, but he eventually persuaded his county health officer to call the Ebola Treatment Unit in Bong County. I am embedded with USAID, following a team from the nonprofit International Medical Corps on their hunt for Ebola patients in rural Liberia. The village where I met Boimah is our second stop of the day. It's impossible to travel anywhere quickly. We start the day weaving our way down the road out of Monrovia using both lanes, trying to avoid oncoming cars, trucks and the teeth-jarring potholes caused by the long rainy season. We are in two large white SUV's and ahead of us, the International Medical Corps are driving two makeshift ambulances -- pickup trucks outfitted with metal frames and covered with bright orange tarps. Outside the town of Kakata, we are stopped at a checkpoint. “Everyone out,” one of the guards tells us. No one passes without having his or her temperature checked. 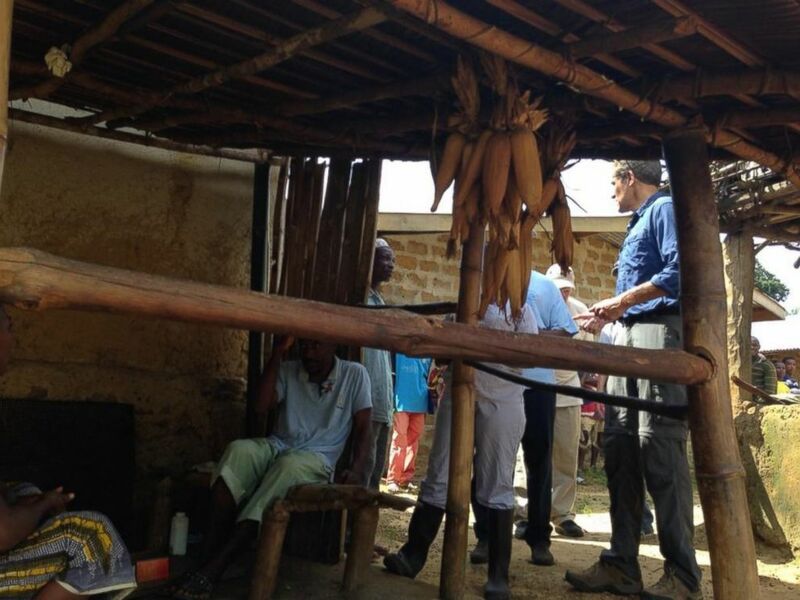 Dr. Richard Besser posted this photo to Twitter with the caption, "In village of Mahwa. A baby is sick. Shared bed w/ father who has #Ebola. Taking baby to treatment unit." A fever in Liberia is more likely due to malaria than Ebola, but these checkpoints are one way the government is trying to contain the outbreak. We walk up the little hill to the cement shelter where a young woman with an infrared thermometer holds court. "36 degrees" Celsius, she shows me after holding it next to my temple. I don’t have a fever. Those who do are detained until a medical team can assess them. Our first pickup of the day is in a village called Mahwa, a small cluster of wood and mud houses. Garmai, a young mother, sits on a stool in her outdoor kitchen, holding her listless baby son, Freeman, on her lap. He's not quite a year old and he's breathing rapidly. I can see his belly pulling in with each breath, while his arms just hang at his sides. Freeman's father and grandmother have Ebola and are in the Ebola treatment unit in Bong County, where we will be heading for the night. While the woman feels fine, it’s clear her baby does not. He's hot to the touch and has not been eating. No diarrhea or vomiting, but he's had a cough. Freeman sleeps with his parents on a common sleeping mat in the cramped quarters behind them, she says. The opportunity for exposure was there. Though the baby might have Ebola, it’s also possible he has pneumonia, a common killer of young children in its own right. He needed to get to the treatment center for testing and care. As they climbed into the back of the ambulance, a crowd of villagers looked on approvingly. Mahwa is unique among rural Liberian villages because it welcomes health workers and believes that taking patients to treatment centers is the best approach for everyone. They even told me about how they are washing their hands to prevent the disease from spreading. With Garmai and Freeman in the ambulance, we moved on to pick up Boimah in a village two hours away. "He's a good boy. Very hardworking. The doctors will help him," his father said. The look on his face was one of hope mixed with despair. He told me of the beloved healer who had likely infected his son. "He was a great man. A beloved man. He took care of me." He pulled up his pants leg to show me where the healer had stitched up an old leg wound. "If he hadn't had Ebola, everyone would have come to his funeral. Now, we couldn't even say goodbye." Then, as Boimah climbed into the orange ambulance for the four-hour ride to the Ebola treatment unit, a rainbow arced across the sky. On a day full of trepidation and disease, a much needed sign of hope. Dr. Richard Besser posted this photo to Twitter with the caption, "Along road to Bong County all cars stop + our temperatures are checked. If anyone has fever they are held."